Extremely wide choice of holesaws. 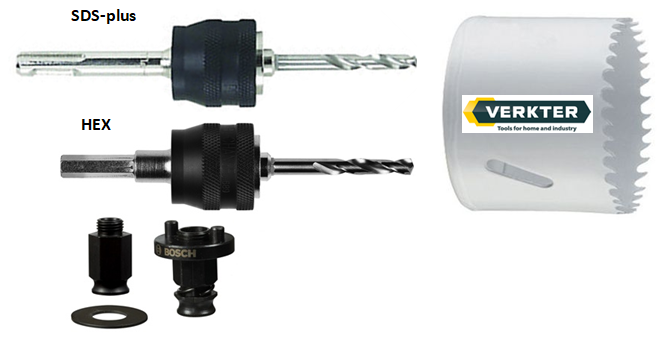 Here you will find holesaws for metal, wood, plastics and building materials from worldwide known manufacturers, such as BOSCH, MAKITA, METABO, PFERD, IRWIN, TYROLIT. Special filters will help you choose the right holesaw. You can filter products by manufacturer, diameter, overall length, shank type, drilling material and price. All necessary accessories for holesaws you will find in section "Holesaw adapters and centering bits". 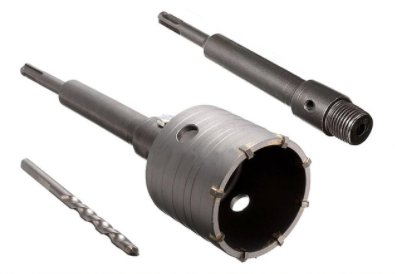 One of the most popular holesaw types is "holesaw + adapter" system. Depending on the tool you have, the adapter can be selected with a cylindrical or SDS shank. After purchasing adapter you can mount on it different diameter holesaw for drilling wood, metal, plastic and building materials. A similar system is also used for concrete holesaws, but this system is more robust, as it is suitable for impact drilling. Usually the shank of adapter is longer, holesaw walls are thicker, the edge of holesaw has bimetal plates. Quite often, concrete holesaws are produced as monolith structure - this further increases the strength of its construction.